Honeywell’s feature-rich 6280 Color Graphic Voice Touchscreen Keypad features a high-resolution 7″ widescreen TFT display that doubles as a digital picture frame. There is a choice of silver and white color schemes, three language options and voice annunciation of alarm conditions. The new intuitive user interface features icons and menus that make system operation easy to navigate. The 6280 uses the same icons as Total Connect 2.0, helping to reduce end-user training and costly false alarms. The choice of two color housings and three languages (ideal for homes with multilingual members) Silver blends perfectly in stainless steel kitchens and garages. White, a popular classic choice, blends seamlessly with lighter décors. 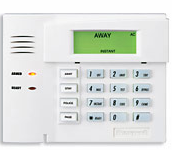 Add wireless technology to any installation with Honeywell’s 6150RF keypad. It offers the unbeatable combination of attractive, convenient features and competitive value in a single, quick-install package. It is the ideal choice where wireless keys are to be used. 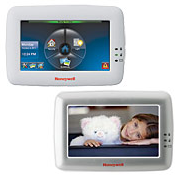 Honeywell’s Tuxedo Touch is a 7″, high-resolution graphic touchscreen that functions as an integrated security system, home controller, camera viewer and digital picture frame in one. It is a cost-effective way to seamlessly integrate security with cameras and Z-Wave® enabled thermostats, lights, locks and shades. Whether controlling the security system or other functions within the home, the large graphic icons—which also match the Total Connect interface—simplify operation. Homeowners can receive important alerts about events remotely with Honeywell Total Connect™ Remote Services. A digital picture frame feature can be managed by end-users with the simple insertion of an SD card—letting them create cinema-quality slideshows right at the Tuxedo Touch display. A choice of white or silver/black blend with any décor. Tuxedo Touch is available in English, French Canadian and Spanish language options, with voice annunciation of alarm status (English only). 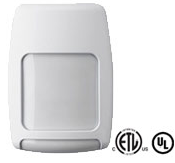 Honeywell’s 5800PIR Series of Wireless Motion Detectors are high-performance, easy-to-install sensors featuring sleek, compact designs that are ideal for applications where aesthetics or discretion are critical. On the 5800PIR and 5800PIR -COM, PIR sensitivity and temperature sensing can be enabled via programming locally or from the central station. Other notable benefits include fewer service calls thanks to a long-life battery and empty cases, which allow designers and end-users to custom-paint the motion detectors to match any residential or commercial setting. The 5800PIR blends perfectly with all of the 5800 Series family of sensors for a seamless look. Automatic walk test mode turns on the walk test LED for ten minutes when cover is opened and closed or when a battery is installed. Walk test mode can also be triggered with a flashlight on the 5800PIR and 5800PIR-COM. The new PIRs are 50% smaller than the 5890PI. Also, dealers can install one family look whether they use hardwired, V-Plex or wireless in order to complete the job. In addition, if the dealers need to mix and match sensing technologies, the look of the installation is consistent. Only one battery to replace. (< 45° F) warns when temperatures are approaching the freezing point (except 5800PIR-RES). In almost all cases, your security / life safety system relies on proper operation of the telephone line to reliably communicate alarm signals to the central station. With a VOiIP or digital telephone phone service, your alarm system may be unable to consistently and reliably send alarm signals to the central station due to interruption of service or tampering of the phone line. Alarmnet is the solution to this. Watch the video below (or wherever it is) to learn more about Honeywell’s Alarmnet solution. 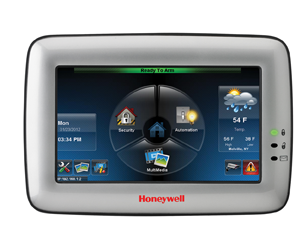 Part of Honeywell’s family of self-contained wireless controls, Honeywell’s LYNX Touch 5100 features a bright, full-color touchscreen with graphic icons and intuitive prompts for easy operation. It features garage door notification and control, tornado alerts for U.S. and Canadian residents, Z-Wave® automation capabilities and advanced alarm communications. Our Wi-Fi® module offers the lowest cost alarm communications/ remote services solution—saving installation time and reducing monthly operating costs. Whether used as back-up or primary, the advanced 4G radio finds the best signal (2G, 3G or 4G) in the area—improving longevity and maximizing installation opportunities. These options give security dealers the flexibility they need to service all of their customers, whether they rely on mobile phones, VoIP or POTS lines. Honeywell’s L5100 Connect app, provides consumers with the ability to use an iOS device to operate the system on premises. The Z-Wave connectivity module lets installers integrate security, lighting, thermostats and more—for local and remote control. With Honeywell Total Connect™ Remote Services, users can control security, thermostats, lighting, locks, receive alerts and more from most smartphones, tablets and computers.